After years of lagging behind, the continent’s bandwidth is now growing faster than anywhere else in the world. Huge progress has been made on developing intercontinental cables that tie the continent into global telecommunications. Analysts TeleGeography have calculated that African access to international bandwidth has increased twentyfold over the past five years, as the Sea Cable System (SEACOM), the Eastern Africa Sub Cable System (EASSy) and the West Africa Cable System (WACS) have been completed. Yet according to the International Telecommunications Union, just 10.7% of African households have fixed-line access to the internet at home, so there is still a very long way to go. Africa’s internet bandwidth has grown by an average of 51% over the past five years, faster than any other region, reaching an expected 2.9 terabytes per second (Tbps) by the end of this year. This is down from the 93% CAGR recorded over the period 2006–10, although part of this slowdown is the result of lower investment in North Africa because of political instability and security problems in Tunisia, Libya and Egypt. The CAGR for the five countries of North Africa for 2011–15 was 43% in comparison with 66% for Sub-Saharan Africa. Global internet capacity is scheduled to grow by 31% this year, down from 41% in 2011. However, African capacity is still small in comparison with the size of the continent’s population. The Middle East already has 8.4 Tbps. As might be expected, countries with direct access to international fibre cables have more established national fibre backbones and lower bandwidth retail costs. This overwhelmingly favours large countries with a coastline that can negotiate for connections to cables, while landlocked countries have higher costs and more limited infrastructure. As in the logistics and tourist sectors, being landlocked is a major drag on growth on African economies. The big challenge has been last-mile connectivity: the extension of networks into homes and offices. Even in the best connected cities, the cost of connecting individual properties is often too high in comparison with the potential revenues. This mirrors the development of water, power and gas infrastructure where the cost of providing last-mile infrastructure often deters project development. Nigeria’s low ARPU discourages investment in last-mile networks, so the Nigerian Communications Commission (NCC) has offered financial incentives to operators to take services to customers, although it is too early to judge their success. The sheer size of the Nigerian market, however, makes it a vital piece in the jigsaw for companies with continent-wide ambitions. As of the end of June this year, MTN remained dominant with 62.8m subscribers, more than twice as many as its nearest competitors, Globalcom (31.5m) and Bharti Airtel (29.5m). South Africa is now connected to four undersea connections, up from just one in 2008, with another on its way via the extension of the Ace cable from Nigeria to South Africa. SEACOM CEO Byron Clatterbuck said: “Certainly, the challenge is not on the international side and that’s what we’ve seen. We’ve unleashed the international side. We have terabits of capability sitting there in our [point of presence] in Teraco. You need to be able to take that over to the customer. Basically, every carrier wants to build the most resilience that they can at the lowest cost that they can. Adding another cable from a wholesale perspective means that you have more choice, which is a good thing. Probably it will have a price impact on the wholesale marketplace. 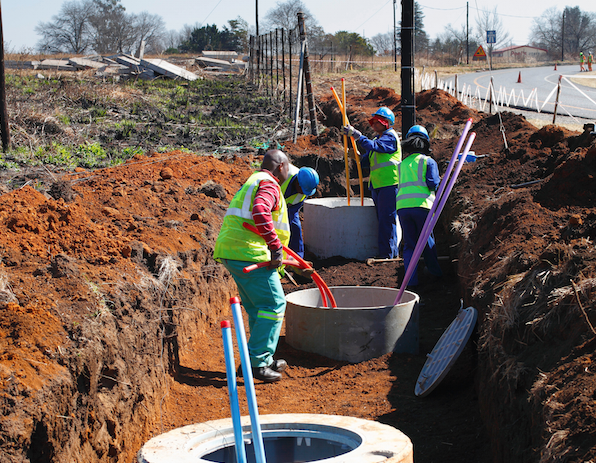 At the enterprise level, it won’t really impact.” The government of South Africa is currently funding research into how last-mile infrastructure can be financed. While smaller towns and rural areas remain unconnected, the number of cities with fibre-optic grids is increasing. One of the most recent projects is Paratus Telecom’s announcement that it is developing a new network in Windhoek. The company, which also bought a voice licence in 2014, is providing 10 gigabytes per second (Gbps) capacity that can be upgraded to 100 Gbps at a later date if required. Such rates are now advertised in South Africa, where video streaming and online gaming are now available, in some areas at least. Achieving them in practice, however, is another matter. Google has built a fibre-optic network in Kampala as part of its Project Link programme and in October announced that it had chosen Ghana for its second investment. The network covering Accra, Tema and Kumasi will be at least twice as big as the Kampala scheme. Such undertakings are still not commercially viable but Google hopes that it will be able to recoup its investment through the advertising sales that it hopes to build up over the longer term. Such adverts generate about 90% of its revenue elsewhere in the world. While broadband infrastructure continues to be developed on a national basis, there are a growing number of cross-border investors. For instance, Smile Telecoms of Mauritius has already constructed LTE [Long-Term Evolution] networks in Tanzania, Uganda and Nigeria, and plans to launch in Democratic Republic of Congo (DR Congo) in the first quarter of next year. It has secured $315m in debt financing arranged by the African Export-Import Bank and mainly provided by African banks, plus $50m from South Africa’s Public Investment Corporation. Just 6.5% of the population of DR Congo has access to the internet, in comparison with 38% in Nigeria.